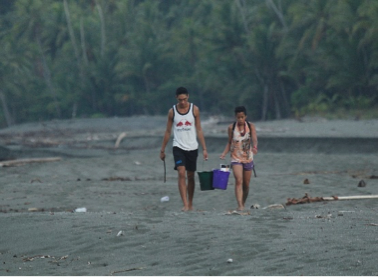 In Osa, beach field work is dictated by the behavior of the waves. Here, we are used to large waves, high tides, and strong rip currents that keep us out of the water, even on the hottest of days. But this past week, our shores were bombarded by monster waves that were truly impressive in their ability to restructure the beachscape. The ocean is a formidable force here, taunting you as you awkwardly trudge through the hot sand hunting for just the right hermit crab. You want nothing more than to cool off in the water. But you know better. Here, it is too dangerous to go in the water. But these new monster swells made the typical Osa waves look like puddle splashes. Fallen palm trees and logs that had littered the beach have since been completely washed away. The cliff along the tree line that distinctly marks the high tide line of the highest high tides in the area has been replaced by a gentle slope of sand. Where there once was a flowing river is now a small lagoon as the waves brought up more and more sand to fill in the beach. And where there once were hundreds of hermit crabs roaming the beach, there are now a few brave souls that venture out in the night. 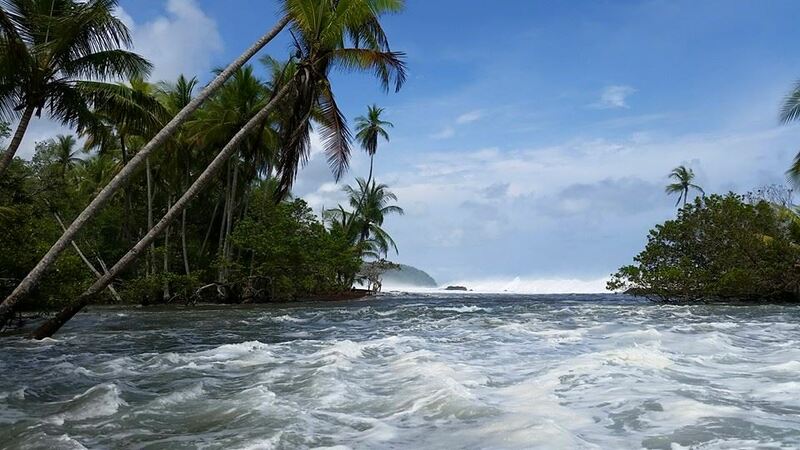 These monster waves were not isolated to just Osa Peninsula or Costa Rica, but stretched from North to South America, causing damage to shorelines, coastal ecosystems, and beach front properties. But they also brought a bit of fun to some daring surfers who braved the large swells and strong rip currents for a chance to catch these ridiculously large waves. And though some found joy in surfing these uniquely large swells, the unexpected intrusion of churning water brought many complications for the local terrestrial hermit crab populations here in Osa. National weather services all along the Pacific coast issued safety warnings concerning the impending sea state. The high surf was the result of long-period swells generated by a storm brewing southeast of New Zealand earlier in the week. The increased sea state also brought along strong rip currents. The swells raced across the Pacific at about 50 kilometers an hour, covering about 1,200 kilometers a day, finally stopping only when they broke along our shoreline. In California, waves averaged about 3 meters, delighting local surfers, but brought dismay to property owners whose homes experienced minor flooding. At least 16 people were rescued due to the high waves. Cruise ships had to emergency dock and cut their voyages short to steer clear of dangerous waters. 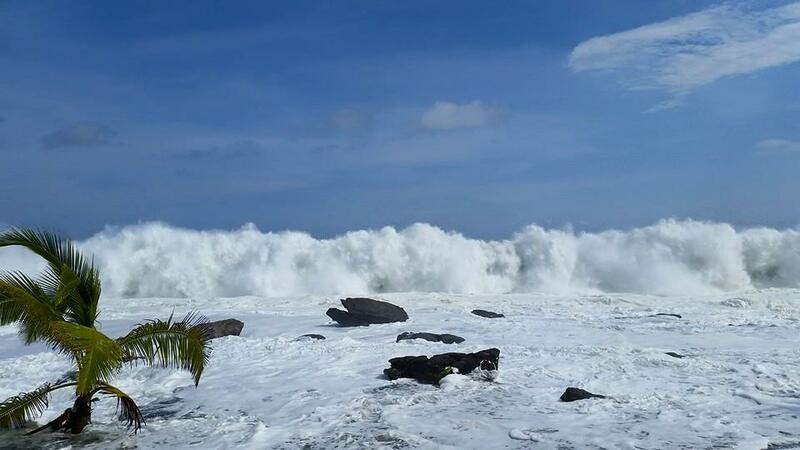 In Mexico, waves up to 4 meters were also recorded, leading to flooding and one fatality. Two more fatalities were reported in Panama and Chile and one person remains missing in El Salvador due to the stormy seas. 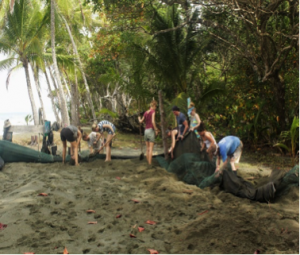 In Costa Rica, the dangerous swells also caused an environmental catastrophe as a barge capsized within the Nicoya Gulf, spilling 180 tons of fertilizer into the coastal waters. Environmental workers and local law enforcement agencies have been working to quantify the effects of the spill and have warned the public to stay out of the water. Dead fish have been floating to the surface in association with the spill. Officials are concerned that the fertilizer could not only be toxic to some organisms, but could stimulate a harmful phytoplankton bloom, further altering the ecosystem. Here in Osa, the swells brought the tides up into the jungle, washing over trails. They also washed away several of my field experiments for the hermit crabs. I arrived in Osa about two and a half months ago to study these hermit crabs in their native habitat. These terrestrial hermit crabs are unique in their ability to actively carve out the inside of the snail shells they use as their homes. To determine how, why, and the costs and benefits of such a laborious behavior, we devised several field and manipulative experiments to be carried out. Unfortunately, three of these field experiments have now been claimed by the sea and its monstrous waves. Nightly transects during low tides after the monster waves subsided showed how barren they left the beach. Hermit crabs that once littered the beach foraging for fallen coconuts, washed up detritus, and anything else they could find, were completely absent. A few large individual could be found deep in the mangroves and up above the water line in the trees. The waves not only washed away the existing experiments, but washed away and displaced full populations. But as frustrating as it is, having your experiments and organisms washed away, it was really interesting to be able to witness this anomalous event and be able to document its impact on the local ecosystem. This is the time of year that we begin the construction of a new sea turtle hatchery, with means removing plants and cleaning and filtering the sand where the eggs will be relocated will be part of our daily activities over the next several weeks and we prepare a new place for the nests that need to be relocated. Last year, we had help from many people in this big and important project, including help from volunteers, research assistants, high schools, universities and the local community. The past year, we were able to relocate hundreds of nests that were located in high-risk zones and areas with high predation rates or large fluctuations in the water level of the rivers and tides. 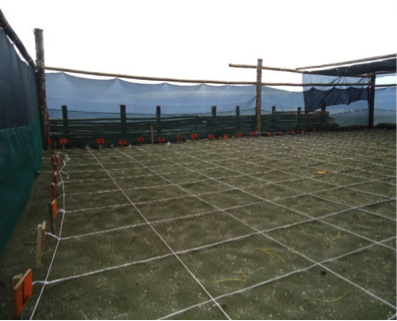 In the end, however, and thanks to the great effort, we were able to release 14,000 hatchlings! 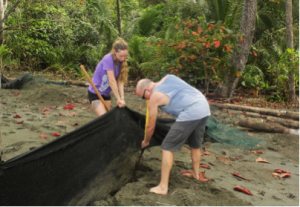 We hope to have a year full of activity from the turtles and help from everyone in order to continue protecting the turtles that nest on the beaches of the Osa Peninsula. Imagine it is hot, very humid and hot, and you are trying to catch every breeze that is coming to you on the way through the camp or the jungle. Even if it is only 8 o’clock in the morning you will start to sweat and you cannot stop it, even if you try not to move at all. 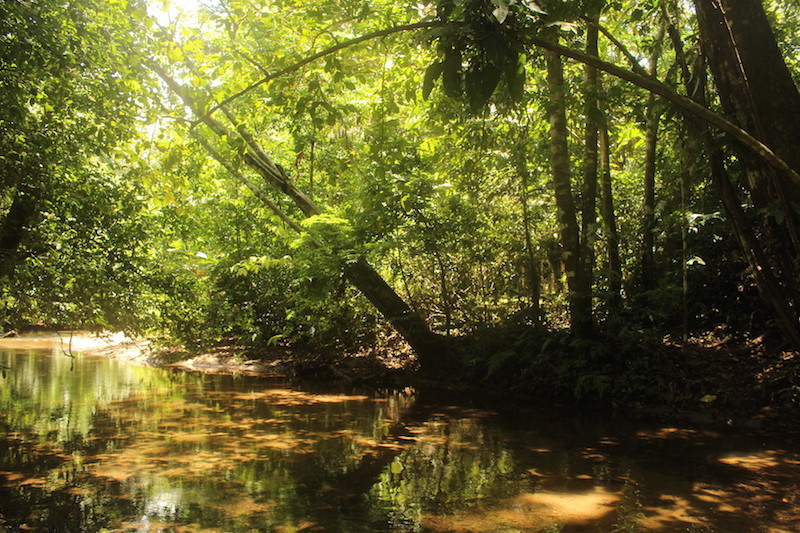 Given that these circumstances occur here on the Osa Peninsula, there is nothing better than having your workplace not just in the shady jungle, but at the cool and beautiful rivers in the shady jungle. This is the place I go to sample the stream water for my water quality tests. For me, it is the perfect place to be. The second you enter the stream, a wave of freshness and calm silence sweeps over you, and the only sounds are your steps in the cold and refreshing water. The first time you may try to avoid letting the water stream into you rubber-boots, but soon you will give up and enjoy the rushes of cooling water running into your shoes. Then you eventually stop, sit down on a riverbank and just listen to the movements and the sounds of the jungle. It is incredible what you can see and hear if you just wait. With enough patience you will see groups of the White Ibis or the big Tiger-heron stalking the river, fishing for food. Spider and Squirrel Monkeys will appear above you, watching you intently and you can hear the Howler Monkeys roar far-off. Right in front of you, the Green Kingfisher will flash by with its beautiful coat of green and white, not getting tired of greeting you with an angry yet cute sound. If you take a closer look you will find traces of other animals that come to the river to drink, or those that come to feed on the drinking animals. So if you are lucky you will not only find the footprints of Peccary, Coati and Agouti, but you also find smaller cat tracks of the pretty Ocelot or bigger tracks of the soundless paws of the puma. We found fresh footprints of the puma one day and every turn of the river brought new excitement: Are we going to see the animal strolling on the riverbanks?! There are certain species that only occur in rivers that are “healthy,” rivers with high water quality, like the sensitive and well-known river otter, whose traces I find frequently at our riverbanks. But also other smaller animals can only live in healthy rivers with a certain amount of canopy cover, a low temperature of water, and a high amount of oxygen. Animals that are not as pretty or famous as the big cats or the river otters, but are very important for the ecosystem and even more delicate than the others. I am speaking of nymphs and larvae of insects. Like the nymph of the mayfly and the stonefly, or the larvae of the caddisfly. They all live in the streams and are highly dependent on the quality of the water. Each of them have their individual interesting story. Many species of the caddisfly for example, build cases around their bodies out of smallest pebbles, tiny sticks or leafs, cut in perfect oval pieces. They use these cases as ballast and protection from predators and they construct them by sticking the pieces together with silk produced by salivary glands near their mouth. So if you lift stones and look in piles of rotting leaves in the streams, you will for sure find one of these fascinating animals. No wonder that at some point people had the idea to let the caddisfly larvae build jewelry for them by providing them only pieces of gold and gems. I am lucky to call this beautiful setting my workplace. And after a successful morning of sampling the water in the rivers and testing it in the lab, guess what I do!? I go back to where both of our rivers meet and sit down in the refreshing and precious water and enjoy the animals around me and the sun above my head.